The Berkshire Fringe schedule for 2011, which runs from July 25 through August 15 in the Daniel Arts Center on the campus of Simon’s Rock in Great Barrington, MA, will include some 50 performances by seven theater and dance companies from as far away as New Orleans and as close to home as Housatonic. In addition, the action-packed three week festival includes 30 Live!, a totally free music series; EarlyStages, a showcase of new plays by emerging writers from New England; and dozens of special events, post-show artist discussions, free community workshops and a new artist residency program featuring the acclaimed San Francisco based comedy group, the Pi Clowns. Since 2005, Bazaar Productions/The Berkshire Fringe has hosted over 300 emerging artists from across the country and around the corner. Hailed as “sassy and experimental” by the New York Times, the festival will present a diverse cross-section of original, high-quality, inter-disciplinary theater, dance and music. Tickets are affordable at the Fringe, a hub for new work by emerging voices. We are bringing back the very popular “pi¢k your own pri¢e” opening nights that make visiting the Fringe the most affordable evening out in all of Berkshire County. For the adventurous Fringe connoisseur, a full Season’s Pass to all seven shows is available for only $75! 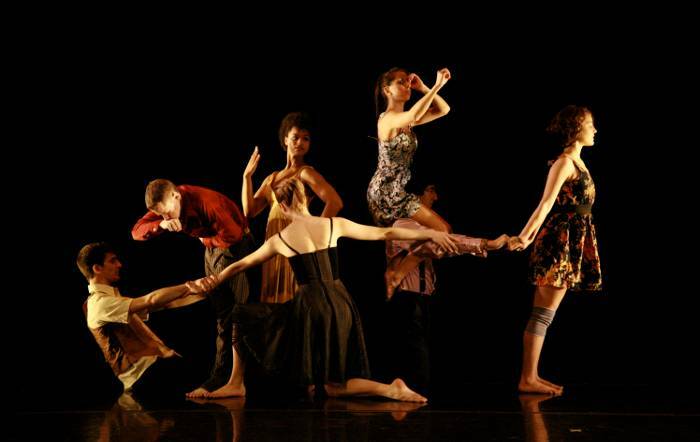 Celebrating seven years of innovative, outrageous and entirely original programming, the Berkshire Fringe’s annual gala presents seven world premiere short works of dance, theater and film. This year, the event is a celebration of artistic ingenuity and innovation centering around stage props and the various ways that they inspire, shape and inform the creative process. A Wheelbarrow…. An Orange…. An Unopened letter. Come experience the myriad of ways that these seemingly commonplace items inspire outrageously original performances! Featuring an open bar courtesy of Domaney’s Liquors and Fine Wines, delectable hors d’oeuvres from Allium, dancing/dj, and a massive not-so-silent auction. Doors open at 6:00pm/7:00pm. Tickets to performances and party: $100, $50, or Pay-Your-Age! Can you find a missing person between the threads of a bed sheet? In this mostly-true, magical-realism detective story, San Francisco based solo performer Jessica Ferris embarks on a quest to find her father who disappeared under mysterious circumstances thirty years ago. In this deftly physical, imaginatively touching and quick witted performance, Ferris transforms everyday objects into extraordinary beings that propel her search for her father, the ultimate con artist living on the lam. A lamp. A toilet seat. The infinite complexity of love. Using humor, text, inspired choreography and song, Philadelphia based dancer/choreographer duo Austin Sheldon and Sarah Konner rip apart our pre-conceived notions of romance and show us the seductive absurdness of human relationships. At times beautiful and stark, poetic and profane, the Ertotics of Doubt asks us to laugh without restraint at our own naiveté, dreamlike longing and desperation – meanwhile we wonder if we should be laughing at all. THE RETURN OF THE PI CLOWNS! 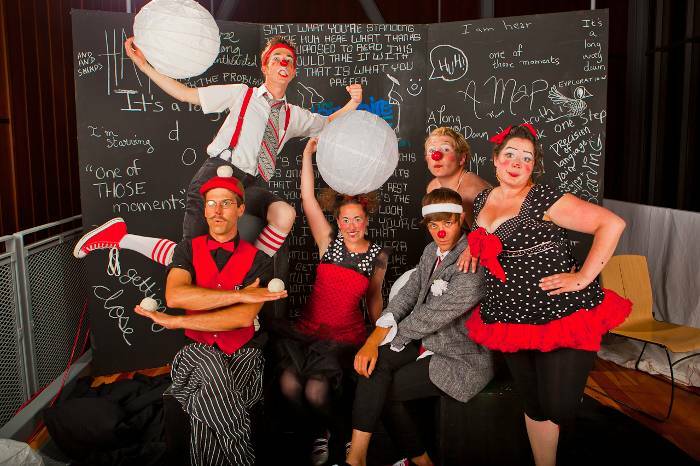 Delightful mayhem and glory await you as the Pi Clowns make their return to the Berkshires. With a heaping helping of new buffoonery, they will have audiences of all ages rolling on the floor with laughter. Using acrobatics, juggling, eccentric dance, live music and improvisation, this epically hilarious posse of Fringe favorites is not to be missed! With key collaboration by Sascha Stanton-Craven. From the New Orleans based theater ensemble Goat In The Road, comes Our Man, a decidedly fictional approach to American political history. Filled with rapid-fire dialog and agile physical comedy, the play explores the contemporary political landscape through the lens of a surreal 1950’s era radio broadcast. Somewhere at the intersection of performance and politics, two men inside a small glass box narrate the life and exploits of one of the nations most controversial leaders, “The Gipper”, who is deftly portrayed by a wooden tennis racket. Inspired by testimonies of Korean Comfort Women during World War II, FACE reveals the harrowing and true story of one woman at war with her past. By unveiling vivid images and asking daring questions about history, violence and sexual slavery, FACE constructs a lyrical exposé of survival. It gives voice to the suppressed history of Comfort Women and pays tribute to the extraordinary resilience of the human spirit. On leave from her Banraku puppet piece on Amelia Earhart, Violet Foster brings the Berkshire Fringe her tour de force inquiry into the life of Bill Viola and a personal look at obsession. Guerrilla video, emotional ballad and ground-breaking performance art converge to ask THE ONLY QUESTION THAT MUST BE ANSWERED. Using poetic narrative, Tangled Yarn unravels the story of Ismene, a heroine living in the shadow of her famed sister Antigone and without a fate of her own. Obscuring the lines between past and present, legend and invention, Ismene must untangle the stories of her Armenian and Latvian Grandmothers in order to determine her own destiny. Featuring incredible and captivating live-drawn projections and animations by artist Kevork Mourad and a haunting original score by the Armenian folk trio Zulal, Tangled Yarn is a multi-media portrait of Ismene’s untold story. True Believers tells the story of star-crossed lovers, psychotic fanboys, aspiring comic book writers, cybernetically enhanced humans, and girls dressed as Princess Leia as they all intertwine in a whirlwind at Comic-Con , the largest comic book convention in the world. Todd returns home to find his mother’s memory falling apart while his father takes advantage of the situation to reinvent himself as the perfect husband. Waltz for Rosemary deals with art, manipulation, and how we hurt the people we love. Want to find the love of your life? Just sign here. Richard and Charlie have tried everything they can think of to find love. The solution might be a new technology that claims it can locate your one and only soul mate. But what if no sparks fly? Saturday, July 31 at 1:30pm- Storytelling through Movement and Text. Group and Solo Performance Workshop with Will Bowling and Chris Kaminstein of Goat in the Road Productions in New Orleans. Saturday, August 13 at 1:30pm- Devised Performance. All performances, events and workshops take place at The Daniel Arts Center, Bard College at Simon’s Rock, 84 Alford Road in Great Barrington. 2011 Tickets to all events are $15 in advance or $20 at the door. All opening night performances are Pi¢k your Own Pri¢e, available only at the door. Ask our box office about a Season’s Pass – See all seven shows for only $75. All workshops, :30 Live! performances and EarlyStages readings are free unless otherwise noted. For directions, tickets, workshop registration, and all other information please call (413) 320-4175, e-mail us at info@berkshirefringe.org or visit www.berkshirefringe.org.